Big news! On March 26, we announced two new cities we'll be working with to set up Environmental Impact Bonds (EIBs) to finance green infrastructure and create greener neighborhoods: Atlanta and Baltimore. Atlanta Mayor Keisha Lance Bottoms (pictured below) announced this morning at the 17th Annual Parks & Greenspace Conference that the city's Department of Watershed Management will use EIBs to finance green infrastructure projects which will improve the resilience of an area that has been devastated by flooding in recent years. The Rockefeller Foundation is working with Quantified Ventures to help cities get started with EIBs. Through a partnership with municipal bond broker-deal Neighborly, the city will become the first-ever municipality to issue publicly offered EIBs, allowing citizens to become investors in their own city. Read the full press release here. 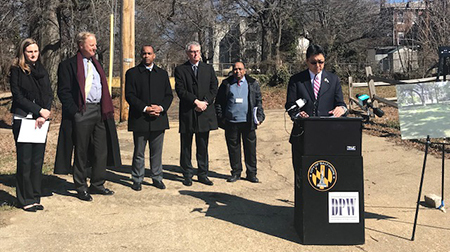 From a green infrastructure site in the Harlem Park neighborhood of Baltimore, Department of Public Works Director Rudy Chow (at podium in photo below) announced that EIB financing will help Baltimore fund 90 special landscaping projects in more than three dozen neighborhoods. The built-in accountability of the EIB was attractive to the city government. Initial funding for this project, which is being coordinated through the Chesapeake Bay Foundation and Quantified Ventures, was made possible through an anonymous donor that was matched in part by a grant from the Kresge Foundation. If successful, this approach could be applied throughout the Chesapeake region to meet water pollution goals, and also to improve the quality of life in neighborhoods and communities. Read the full press release here. In partnership with the Rockefeller Foundation and Chesapeake Bay Foundation (with Kresge Foundation support) respectively, we are providing advisory services to these cities as they structure the bonds. We are still accepting applications to provide this same support to your city. At Quantified Ventures, we are creating a movement, one we believe will be a key part of the future of public finance. Budgets are continually squeezed. At the same time, there is an ever-growing group of impact investors who are looking for deals that not only generate a return but more importantly help improve our environment and our communities. Is your city next? Urban Institute Blog: Can pay for success help save the Chesapeake Bay?